Written after his wife's tragic death as a way of surviving the "mad midnight moment," A Grief Observed is C.S. Lewis's honest reflection on the fundamental issues of life, death, and faith in the midst of loss. This work contains his concise, genuine reflections on that period: "Nothing will shake a man � or at any rate a man like me � out of his merely verbal thinking and his merely notional beliefs. He has to be knocked silly before he comes to his senses. Only torture will bring out the truth. Only under torture does he discover it himself." This is a beautiful and unflinchingly homest record of how even a stalwart believer can lose all sense of meaning in the universe, and how he can gradually regain his bearings. Clive Staples Lewis, was born in Belfast, Ireland, in 1898. As a child, he was fascinated by the fairy tales, myths, and ancient legends recounted to him by his Irish nurse. The image of a faun carrying parcels and an umbrella in a snowy wood came to him when he was sixteen. Many years later, the faun was joined by an evil queen and a magnificient lion. Their story became The Lion, The Witch, And The Wardrobe. Six further Chronicles of Narnia followed, and the final title, The Last Battle, was awarded the United Kingdom's prestigious Carnegie Award. Lewis was Fellow and Tutor in English Literature at Magdalen College, Oxford, and later was Professor of Medieval and Renaissance Literature at Cambridge University, where he remained until his death in 1963. 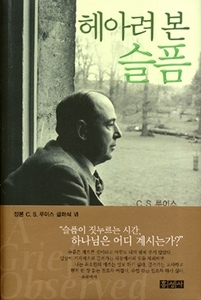 He wrote numerous books of literary criticism and on Christianity, the best-knowing being The Screwtape Letters, as well asfour novels for adults. The seven books of The Chronicles of Narnia were his only works for children.